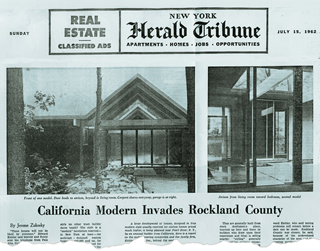 The New York Herald Tribune likened Eichler Homes' arrival to an invasion with their headline from July 1962. 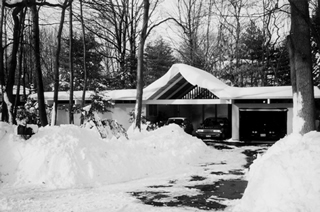 It's a chilling sight — an Eichler actually covered with snow! It was one of Joe Eichler’s most challenging assignments, and he’d brought it on himself. Develop a community of homes, not 45 minutes from Eichler’s home base, as he did in 1955 in Walnut Creek, and not eight hours away, as he did in 1960 when he built his first subdivision in Southern California. No. This time he would build 3,000 miles away—the other side of the continent, in woodsy upstate New York, back when it was still country, not even a suburb. “I had a terrible fight with my father,” says Ned Eichler, who ran marketing for Eichler Homes and often acted as his dad’s fiscal conscience. He regarded the 1962 project as a distraction from the company’s core Bay Area business. “Part of the reason we built there,” Ned says, was, “my father grew up in New York,” in the Bronx, to be precise, a borough of New York City just 45 minutes from Joe’s chosen home site, a drive up the Hudson River that’s pretty in parts, spectacular in others. Ned, it turns out, was right—on the whole. Instead of building 216 homes on 140 acres, as planned, Eichler built only three. He was done in by difficulties building the houses. Ned said Eichler Homes lost $100,000 on the project, a good sum at the time. What’s really magical about this tiny Eichler subdivision isn’t that the homes got built but that they continue to be loved and preserved. Remarkably, all three of the homes retain their original outward appearance. Even more remarkably, though surfaces have been altered, inside they’re quite intact as well. How many Eichler neighborhoods of any size can brag that they’re almost 100 percent original? True, preserving three Eichlers is a lot easier, percentage-wise, than preserving 150 or 200. But this is in the woods of New York, where you wouldn’t expect to find the same gung-ho Eichler spirit that animates, say, in Palo Alto. “Even though there are only three houses, it seems very Eichleresque,” says Martina Brix, a turban-wearing designer from Germany who enjoys gardening by the light of the moon. “It smells nice and you can see the deer,” she explains. All three owners are committed to preserving the architecture, they say. “We’re trying to figure out what the house was so we can get it all back to what it was,” says neighbor Tim Santos, who’s studied so many Eichler house plans he can rattle off model numbers like a pro. (Theirs is Jones & Emmons model 1505.) He and his partner Larry Callahan have embarked on a five-year restoration.